1) From t=0 to t=12 s, the curve is a straight line parallel to time axis .i.e velocity is constant during this interval. As the velocity is constant, the net force acting on the skydiver must be zero since there is no acceleration. Therefore, the magnitude of the air resistance is equal to the weight of the skydiver. 2) After he opens the parachute, the velocity decreases sharply at first as can be seen from the diagram. If the velocity of the fall is decreasing, it means there is a net upward acceleration, therefore, the force of air resistance must have exceeded the force of gravity on the skydiver. This increase in air resistance is due to an increase in the surface area after the opening of the parachute. From the graph, it can be seen that the rate of decrease of velocity ( upward acceleration) is greatest at t=12 s (opening of the parachute) and then decreases in later times. This indicates that force due to air resistance is greater at t=12 s than compared to later times. 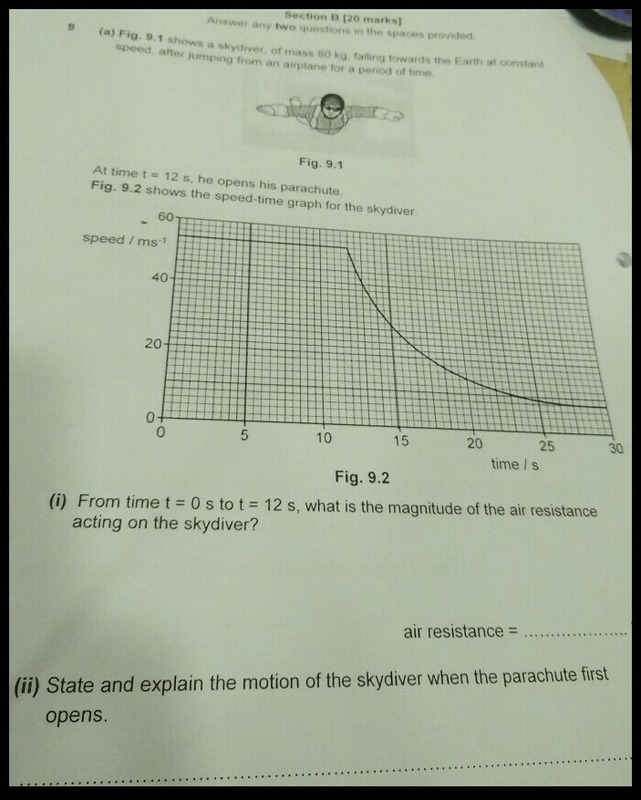 At t=30s, the rate of change of velocity is almost zero, therefore upward force due to air resistance is again equal to the force of gravity of the skydiver. This is due to the fact that the force of air resistance depends on the velocity of the object in the air. Higher the velocity, higher the value of this force. As the velocity was greater at t=12 s, the force due to air resistance was greater (even greater than the gravitational force). As the velocity of skydiver decreased, this upward force also decreased during the journey. Again a point was reached at t=30 s when the upward force dropped down to a value which was equal to the downward force due to gravity. At this point, the forces again became equal and the acceleration of the skydiver again became zero. So the skydiver again continued to fall with a constant velocity, but with a reduced magnitutde. Hope this cleared your doubts.